As is often the case, I saw something on Facebook and it’s turning into a blog post! Much of my inspiration comes from others and their thoughts, worries, suggestions, and (of course) social media posts. This particular motivation to type came in the form of a quote by writer, illustrator, and greeting card designer (that job would be so cool!) Emily McDowell. The quote is great, and I’ll get to that in a minute, but she shared a little back story when she posted the graphic as well. And it’s good too. I wouldn’t want you to miss out on that wisdom. Ms. McDowell explains that she used to think that taking herself seriously might lead to arrogance, but has come to see that isn’t necessarily the outcome. There’s a lot about this I love. First, she did not accept her first belief as the only belief she’s allowed to have. Through life’s journey she’s learned differently and is adjusting her view accordingly. That’s a thing. Do it! Secondly, being arrogant, I think, stems with thinking too highly of one’s self. Being honest and truthful about yourself is different, even when being honest and truthful is complimentary. Often, we brush off compliments and reason away our own acknowledgements of jobs-well-done when we could simply say thank you or take a moment to recognize ourselves the way we might look at someone else who’s deserving of a compliment. You can be deserving too. Accept it. As long as you realize your poo stinks just like everyone else’s, you’ll be well-grounded and not slide into arrogance. Lastly, and probably the biggest part for me, is a phrase from before the comma – “fully inhabit your purpose.” Whoa. Scary. Big. Exciting. Go back and read it again. It’s worth it. As I piece together what I’m starting to feel is a spiritual calling, there are memories from every stage of my life that keep coming back to me and are continually affirming the path I’m headed down. The woman I’m unearthing has always been there, as evidenced by the fact that no one who knows me is anywhere near as surprised as I am by my personal revelations! My connection to a universal, spiritual energy was buried by my own fears, my own assumptions, the cultural norms around me growing up. The desire to help others was filtered into motherhood and years of schooling to be a therapist. Neither of those is wrong, but neither was the chair I was meant to sit and rock in forever. Both have helped lead me to now, though, and given me incredible knowledge and experience to draw upon as I grow even more. 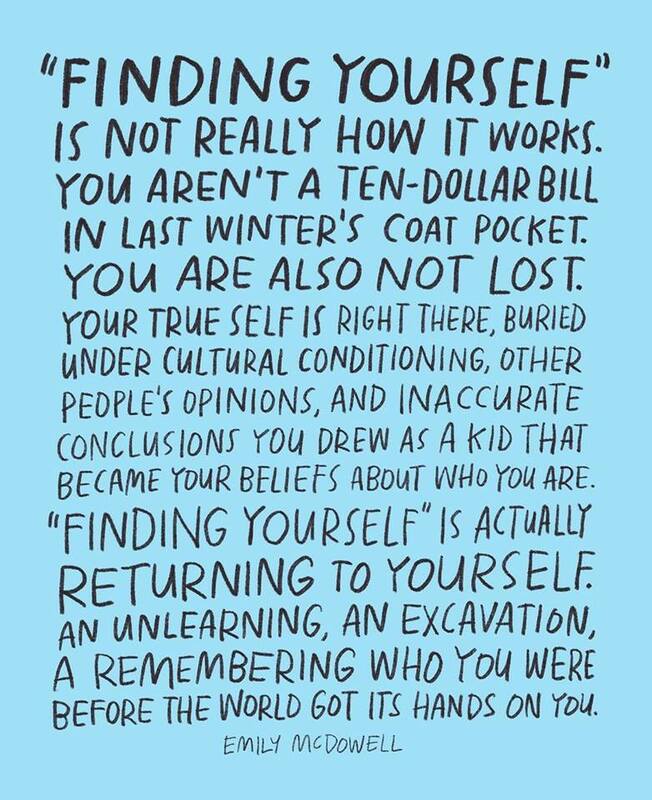 I am unlearning what I’ve believed about myself and learning anew what an incredible world exists before me. I am finding the woman who’s been waiting for her turn to shine. Don’t get me wrong, a vacation to find myself on a beach somewhere might not hurt one bit…but McDowell is right…it’s not necessary. I don’t need to run off to find who I’m meant to be. I simply need to look in a mirror. I am an occasionally confident, mostly comfortable woman. That hasn't always been the case, but, I have to say, it feels good to be at this place in my life now! As a mother, wife, sister, daughter, and friend I hope to inspire, educate, and grow with all my readers through this blog. I embrace life and strive to find a refreshing glass of lemonade no matter how many lemons life tosses my way. I'm glad you're joining me on this journey. Cheers! This entry was posted in Deep Breaths and tagged confidence, education, emotions, energy, faith, growing up, love, motherhood, parenting, quirks, Self care, self love, worth. Bookmark the permalink.